Proserv’s Marnie Toal (centre) receives Oil & Gas UK’s Apprentice of the Year Award from David Edwards, CEO of ECITB. 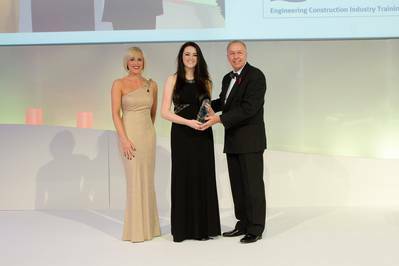 Proserv apprentice technician Marnie Toal was presented with the Apprentice of the Year Award last night, Thursday November 6, after being judged to have made a very significant impact on the oil and gas industry during her relatively short career. Toal’s colleague John Stoddard was also recognized for his achievements when he was named a finalist in the Graduate of the Year category. Proserv said Toal, 18, has made a huge impression since joining the company straight from school just over 12 months ago. From her very first task, where she suggested ways to improve a stripping and flushing rig job, Toal has consistently provided valuable support to her colleagues. The method suggested on her initial task has now been implemented as standard company practice. In addition, her role in a major hose integrity management project saw Toal becoming the pivotal person in carrying out the six month testing of around 600 hoses. Towards the end of the project, Toal, who is based at Birchmoss in Aberdeenshire, was the only person at Proserv in a position to do the work. This would have been outsourced otherwise at a significantly higher cost. Stoddard, 25, of Cults, Aberdeen, has been with Proserv for three years and his exceptional success has not only resulted in him quickly being promoted from graduate to junior engineer but contributed significantly to the company’s global growth and development of its market-leading technologies. His achievements have involved designing and developing a conceptual subsea cylinder for oil and gas sampling and implementing 3D modeling for the first time at Proserv as well as applying this knowledge to support a game-changing subsea sampling system implemented on a project in West Africa. Proserv, which has a global talent pool of more than 2,200 people and operates through 31 operating centers based in 11 countries, has a 40-year track record in delivering life-of-field solutions.